May 18, 1980, Moscow, Russia – 26-year old super heavyweight Vladimir Marchuk of the Burevestnik Team, Moscow wins a national title in the 110+kg class at the 1980 USSR Championships in the Izmaylovo Weightlifting Arena in Moscow. 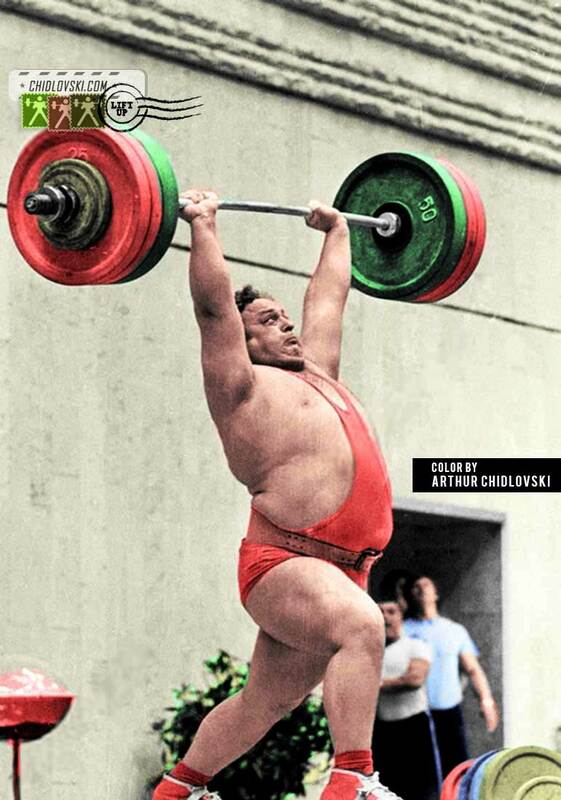 At the 1980 USSR Championships held before the 1980 Olympics, Marchuk won gold medal with a 427.5kg (185+242.5) total. It was his his first and last national title. Neither Vasily Alexeev nor Sultan Rakhmanov (main super heavyweight candidates to the Olympic Team USSR in 1980) competed in the tournament. The silver medal went to the 23-year old Anatoly Pisarenko of Kiev. Vladimir Marchuk (born in 1954) was the first athlete in the world to clean-and-jerk 260kg. He was a strong and respectful lifter with a solid career track in various national tournaments. His strongest lift was clean-and-jerk in which he held 2 world records. In addition to the 1980 USSR title, Marchuk was a 2x USSR Cup winner (1981, 1982) and 2x USSR cj champion (1981, 1982).